Energize, organize and build your violin or piano studio with Ms. Judy. 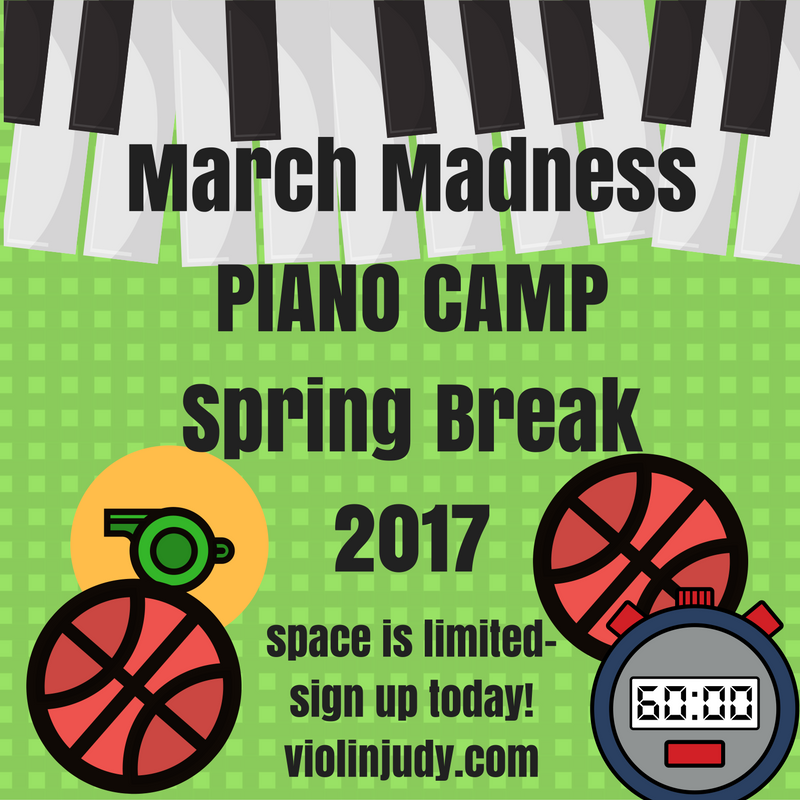 Camps are the new “thing” in piano teaching and I want to tell you about the fun Basketball camp I’m planing in my studio for spring break 2017. If you want to hold a camp I suggest you start planning for it now, as it’s easy to buy a few extra supplies for the camp between now and then, and you’ll have lots of time to prepare! I’m marketing my camp to boys and girls in my studio. Most do a sport or two besides piano lessons (i also teach Violin, thus the ViolinJudy name) and my camp will be a single day. There are enough activities here that you could really stretch them to be more! My studio setup is a piano with 3 great keyboards and 3 junky keyboards (well, they are actually okay, in good condition with pedals and touch response) a few ipads and tablets, an air turn ped and lots of headphones and headphone splitters. I love these fun shaped headphone splitters because i don’t loose them! Here is how i figure out how much to charge for my one day camp: i take the fee (higher than the norm, i treat my babysitters well because i don’t use them often) i pay a sitter per hour and add 50% to that, then i multiply it by each hour of the camp. You are the best judge of how much to charge. The one thing you really MUST buy for this piano camp are these really awesome DRIBBLE GOGGLES! I wish i could remember which piano teacher told me about these, because i’d love to give them a shout out, but if you don’t have some in your studio, you will want them even if you aren’t having a BBall Camp. They are GREAT for getting kids and even adults (one of my adult students asked to borrow a pair to take home!) to stop looking at their fingers and the keys while they play! and then we do some call and response warm ups. if you have a hard floor in your studio you can just bounce a small basketball. the teacher bounces a rhythm and then the students play it back on the first degree of the scale…for your next rhythm they move to the second degree of the scale, ect. The kids love to take a turn making the rhythm, so make sure to switch every scale so everyone gets a chance. If you have littles or beginners who have not learned scales at your camp, have them start on a low C and keep going all the way up the keyboard to the top.If you have a mixed class, older kids can help the younger kids find the correct notes. If you have carpeted floors you can get these basketball cowbells and do call and response rhythms with them. I Love Love Love these Sportactular Warmups by Carolyn Miller! Know that if you decide to invest in some of these items, you will be able to have a basketball camp every year, it will never go out of style! I will buy multiple copies of this because there are nice worksheets in the booklet as well and the price is right! and this Hal Leonard Basketball Bounce piece is ALSO IN PIANO MAESTRO app! If you know me, you know how much I adore Piano Maestro. No, after all that practicing, it’s time for a snack. I’m making an orange or clementine to look like a basketball by adding some sharpie and placing the ball in a cup with more sharpie drawn on to look like a basket. 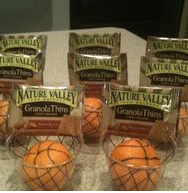 the backboard will be a healthy granola bar! I found this picture on pinterest but the link didn’t work, so i took a screen shot. Kudos to whoever came up with this idea! Next we are going outside for this activity. You might ask each student to bring their own basketball so you don’t have to buy or borrow so many! You could print out the activity and every 2 kids a copy in a plastic page protector, but i’m actually going to let them play on my huge swingset and trampoline while i set up my old junky projector and laptop outside and project the powerpoint images to my garage door! Next we are going to break up and do some independent and group work using some apps on tablets and ipads. I’m also hoping that NOTE RUSH APP will be willing to add a basketball themed background for their app in the spring! I love their soccer theme! Note Rush is an awesome app! We will have one more practice session, then perform some of the basketball pieces for each other in a mini concert. Make sure you pick pieces that are a level below your students’ ability so they can have fun and master them in a short time! and if you like a non sugary reward, these stickers are cool! We will end the day doing these FUN Rhythm Cup Explorations from Wendy Stevens using these awesome basketball plastic cups. You might let the kids take their treats home with them at the end of the day/week or keep them for the next camp! I hope all of this information helps you to get started thinking about having a camp during your spring break. If you have the camp at the beginning of your spring break then you’ll have some extra spending money for a vacation for yourself (even if it’s the next town over) and we all need a vacation! Thanks for reading my blog post! Please note that amazon referral links do generate a very small profit which goes into the maintenance of this site! 12 Days of Inspiration Day 4: New Year’s Resolutions for your Studio! 2017 Favorite Things-Piano Teacher Edition! Biplab Poddar on 2017 Favorite Things-Piano Teacher Edition! ms. judy on Ladybug Recital Reminder! Carol on Ladybug Recital Reminder! ms. judy on The Teaching Aide Every Piano teacher needs!